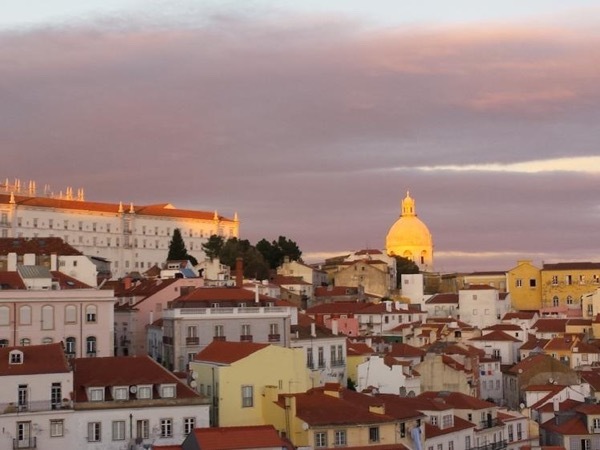 Traveler Reviews for Private Tour in Lisboa, Lisboa, Portugal by Tour Guide Inês V.
Tours by Locals has come thru again. Ines was perfect for our small group - friendly, upbeat, extremely knowledgeable, and patient. Everywhere we walked in the city she was enthusiastically greeted by other tour guides. As it was very hot, she kept us in the shade as much as possible and provided ample opportunity to sit a bit. Thank you Ines - we so enjoyed meeting you. Ines is a wealth of knowledge, very flexible with how the day progresses, and just a wonderful person to spend time with. Thank you for the 3 days of touring Ines! Book with Ines Immediately!! She was an outstanding tour guide, extremely knowledgeable, and truly loved everything about Lisbon. Ines tailored the 8+ hour day perfectly and hit all the spots I had on my list, plus more! It was an unbelievable, unforgettable experience and worth every penny. I now have a friend in Lisbon. Thank you Ines for an amazing day! Ines was delightful! Extremely knowledgeable and well prepared, patient, passionate about the city and adorable. Best money I've ever spent. I can't recommend her tour of Lisbon enough. Please, please. Skip the crowded touristy spots, pricey meals, etc. Instead, spend four hours with Ines and you'll learn a lot about the hundreds of layers of Lisbon's fascinating history.Unforgettable experience. Ines was incredible. Her knowledge and clear love of her city was contagious! She taylored the morning to my requests. Seeing parts of the city that were off the beaten path. Ines showed us the vibrancy of Lisbon. Introducing us to some of the local delicacies. Her knowledge of the neighborhood haunts frequented by the locals made the experience more special. Great day walking tour all around historic areas of Lisbon. Ines speaks perfect English, is very friendly, very well informed and enthusiastic for Portugal and its history. Higher recommend her for any Lisbon area tour. We had amazing time with Ines. She was great, extremely knowledgable, and great personality. She was funny, loving, very professional, and a guide that I would recommend to everybody. On time, perfect communication, and at the same time very flexible. She listened to our needs, and also shared her love of her native town. Ines thank you so much, and we will be back. TOUR GUIDE RESPONSE: Dear Alma, it will be a pleasure to have you back here. I could easily feel your curiosity and enthusiasm about my country. Thank you! The tour with Ines was fantastic! Ines is very personable, and is willing to share not only her knowledge of Portugal, which is extensive, but also the more personal aspects of her country like politics, religion, and contemporary culture. Her English is perfect, and within a few minutes on the tour she makes you feel like you are touring the city with an old friend. By the end of the tour we came away with a much better understanding of Lisbon, Portugal, it's people, it's history and culture. TOUR GUIDE RESPONSE: Dear James, thank you so much for your review. It is great to know I had such an impact in your knowledge about my country. It is wonderful to tell about it to such curious and interested people. Thank you! TOUR GUIDE RESPONSE: Dear Fred,Rhoda, Steve and Grace, thank you so much for your kind review. I loved to spend the morning showing you my city. I hope to have the opportunity to have you here again and/or spend time with friends of yours that visit Lisbon. Thank you again for choosing me to guide you here! Ines was an excellent guide in every way: her english is excellent, her passion for Lisboa palable and helped us understand and feel the city in a way we would never have been able to do alone. The four hours were over very quickly and due to this very pleasant first experience we decided to book her for the whole day trip to Sintra next day also. Highly recommended. TOUR GUIDE RESPONSE: Thank you, Igor and the Ladies :) I had a great afternoon with you, thank you for choosing me to guide you in my city! Inês met us promptly at the designated time and place. She was friendly, enthusiastic and just a lot of fun to spend a few hours with touring around Lisbon. Highly recommended! Wow, Ines was one awesome tour guide! The knowledge she had about the history of Lisbon and Portugal just rolled off her tongue with ease, I think her calling should have been a historian professor at Harvard University. She provide the exact tour I wanted based on my capability and needs. If you are a history buff and want to know the fine details of Portugal's history hire Ines. I am glad my colleagues did not join me since I was able to have a 4 hour 1:1 tour to really appreciate Portugal's history. TOUR GUIDE RESPONSE: Hahaha, thank you, Leonard, for such a spontaneous and kind review! :) I enjoyed it as much as you did. It is wonderful to tell about my country to people interested in knowing it better! It will be a pleasure to see you again in a future opportunity! Ines was fantastic. She was so helpful in accommodating a last-minute tour of Lisbon, which she completely personalized for us. She knows so much about the neighborhoods and history of the region. Made our extra day in Lisbon totally worth it. TOUR GUIDE RESPONSE: Thank you so much, Thomas! You and your beautiful family made it a fun and different tour for me too! Ines was our guide for a day in Lisbon and it was great! Ines loves Portugal and Lisbon and can tell you ALL about history, culture, people, food, art, music and she has a great sense of humour! I've started to read Fernando Pessoa because of her, so that makes her pretty much a perfect guide! Thanks Ines! Lisbon is a city of hills, and Ines helps you see the impact the hills have had on the city and its people over the centuries. Exploring the hills by funicular, tram and walking allows one to fully experience the historical and charming neighborhoods, spectacular views and unique architecture that makes Lisbon such a wonderful place. A wonderful tour by a person who lovers her city and wants to share it with everyone. Lisbon is a fascinating beautiful historical city. Ines was a great guide with extensive knowledge of the city. She is a very friendly and personable guide who speaks fluent English. Would highly recommend her for guide services in and around Lisbon. Our walking tour was great. TOUR GUIDE RESPONSE: Dear Keith, Thank you so much for your kind review. It was a pleasure to be in the company of your family and friends during this tour. I think walking is the best way to know a city and the joy and kindness of your group made it even better! Thank you for booking me for your 4 days in Lisbon! Ines is an awesome tour guide, she is informative and entertaining at the same time. Her Italian is excellent as well as her English. I am very happy to have booked her and I highly recommend her services!!! Inês was great! She was personable and easy to get along with. She was happy to be flexible regarding our needs. She was knowledgeable, but I did not feel like I was being lectured to. We had Inês on our first morning in Lisbon. She related well to us and our college aged kids. Thanks for a great day Inês! TOUR GUIDE RESPONSE: Dear Linda and Alan, Thank you so much! I had a great time with you four, walking around Lisbon and enjoying the fact that I was helping you to discover the city and its little corners and curiosities. Thank you for having chosen to tour with me, you will always be welcome here! Ines met us at our ship for our walking tour of Lisbon. She is friendly, very knowledgeable and led us on a great tour of the area. She told us interesting stories of the history of Lisbon and Portugal while taking us to sites and vistas of the city she obviously loves. We highly recommend Ines. TOUR GUIDE RESPONSE: Dear Gary, it was such a pleasure to guide you and your wife on this lovely city. I am glad you enjoyed it so much!Thank you for your choice, you are welcome whenever you'd like to come back! Our tour with Inez was excellent. Inez was very informative and answered all of our questions. We highly recommend Inez to anyone that wants to tour Lisbon. Brent of the Maple Group. TOUR GUIDE RESPONSE: Dear Alp, Thank you for your review and for choosing me to guide you! It was a pleasure to show you and your wife my city by walking and exploring both the hidden corners and the important monuments. I am happy that you got to visit everything you wanted. We'll meet next time for the Évora tour! What an exciting tour! Ines oriented and welcomed us to the her magical city, leading us to hidden gems that we would never have encountered on our own. Thus, we got a true flavor of the sights, sounds and tastes of the city as we walked its cobbled streets. After a long trip to from Central America to Europe, with a group of energetic teenagers, Ines managed to captivate and relate to each one of us. I commend her on her organization, genuine enthusiasm and ability as a talented guide. TOUR GUIDE RESPONSE: Thank you Ellen, it was great spending time with you and your energetic teenagers! They brought me even more energy :) see you in a near future! Ines is very enthusiastic about her city and country, has immense knowledge about many things. Her English is perfect! We truly enjoyed our tour of Lisbon. Thanks Ines!!! TOUR GUIDE RESPONSE: Thank you so much for your comment Claudia! It was a pleasure to take you, Gil and your daughters on this walking tour of Lisbon. Your curiosity for my city made me feel even more motivated! Ines was at the port to meet our cruise ship. The tour was as described, getting around the city on foot and by short rides by public transport( Ines had already bought our tickets). A stop for coffee in a local cafe was also included .Ines is a very professional guide who speaks great English and we found her tour most interesting and well worth the money. TOUR GUIDE RESPONSE: Dear Susan, Thank you so much for your comment. I also had a good time with you, walking in this beautiful city in order to discover its gems. I am happy that you enjoyed it and found it interesting. Maybe one day it will be you to show me Melbourne!